NXP Mifare MF1 IC S50 (13.56MHz) based keyfob/token. Size: 32mm x 40mm x 4mm, with keychain. 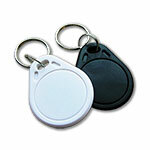 EM Micro ME4200 (125kHz) based keyfob/token. EM Micro EM4200 (125kHz) based keyfob/token.